I've been stuck at my desk the last couple days, trying to make sense of all this paperwork. While I've made great progress, I've come to grips with the fact that this task is going to spill over into the weekend. Usually I have a little knitting project at my desk. It takes the edge off when I'm making phone calls and get put on hold for the umpteenth time. 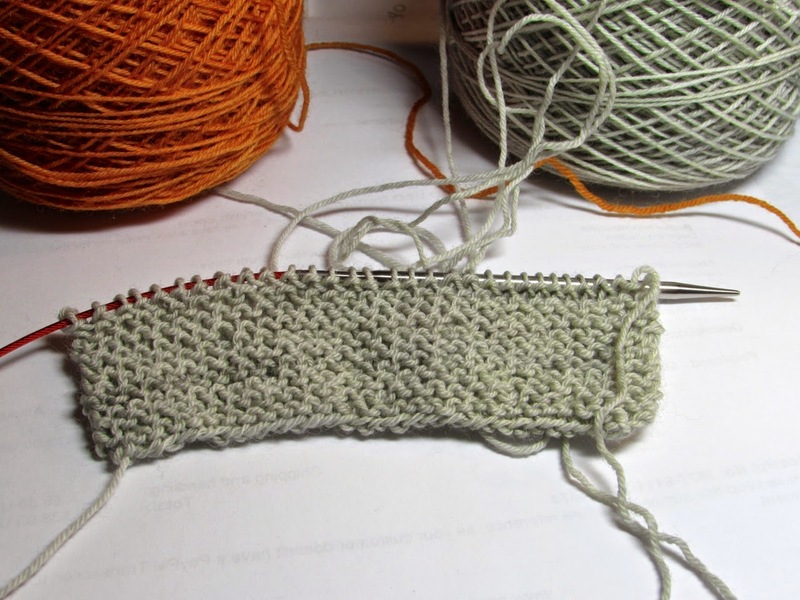 While I didn't have a project handy at my desk, I did have a little swatch to knit up. OK. 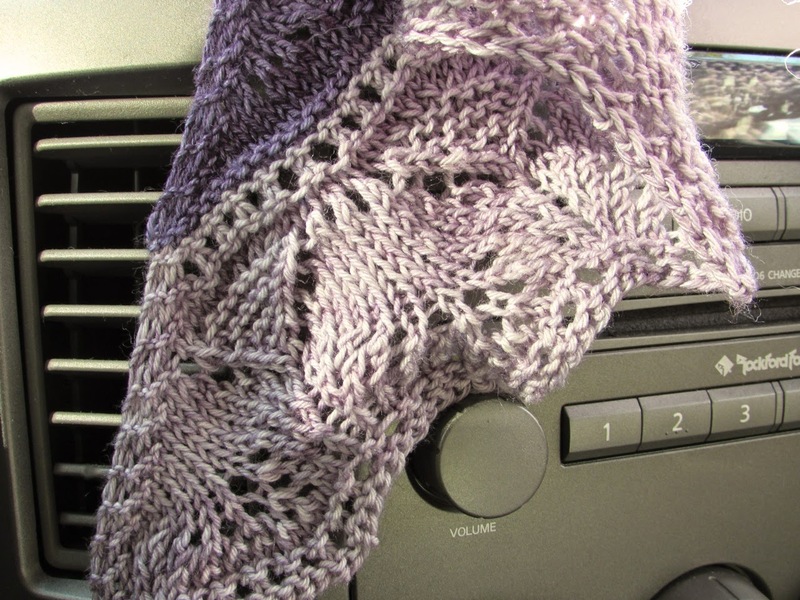 I didn't have to knit a swatch, but it's part of my new project ritual. 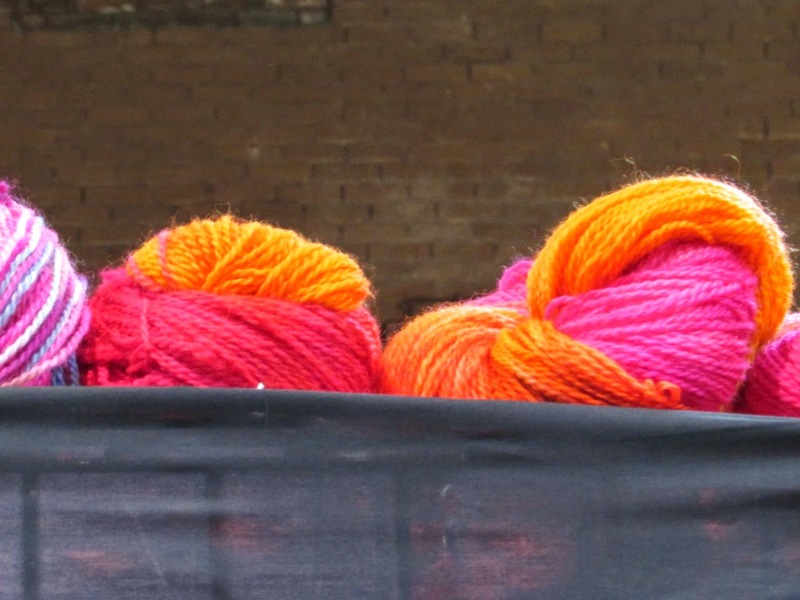 These are the two balls of yarn I had posted about recently. I finally decided on a pattern. All I needed to do was get the project up and running. I did the obligatory swatch and adjusted my needle size. You see. Sometimes swatching pays off. Then I cast on. I told myself I shouldn't do it. There was more paperwork to sift and sort. But then I reasoned with myself that there will always be more paperwork . . . the way the laundry is never done because there are always more dirty clothes. I'm proud of myself. I didn't knit that much. But there are stripes, and they are kind of addictive. As in, "I'm going to knit just one more stripe." Who am I kidding? 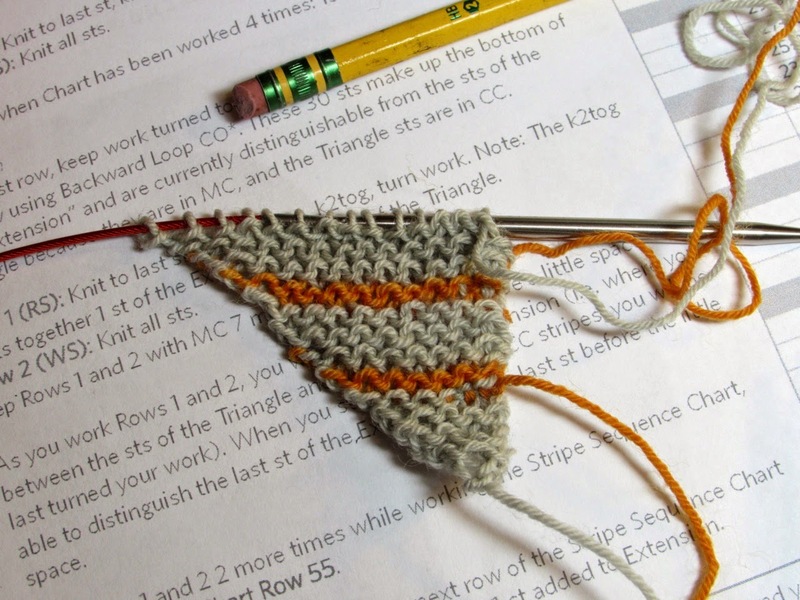 I'm going to need some kind of reward system to allow myself to knit stripes. If not, this pile of paperwork will linger indefinitely. 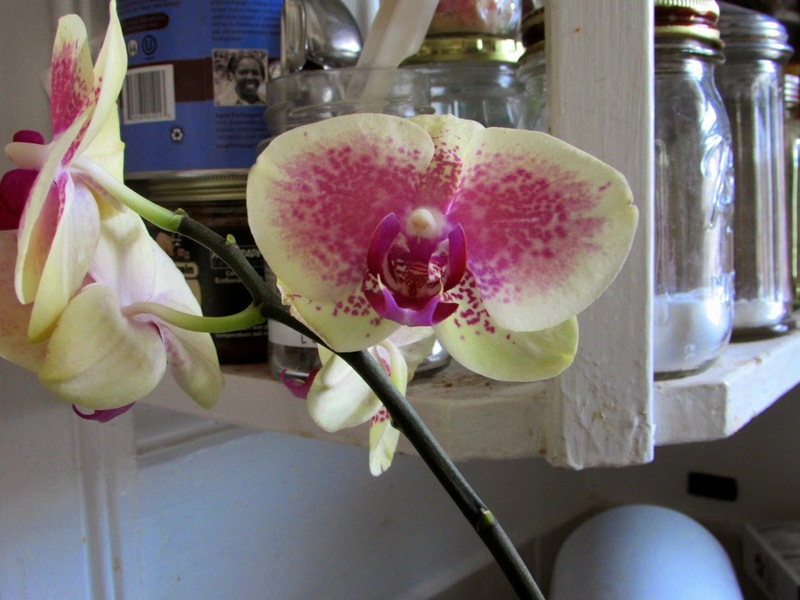 My color inspiration for the week is this lovely orchid. I don't have the green thumb I used to, but my son has been diligent and has kept it alive. The petals remind me of batik fabric. Shop News. 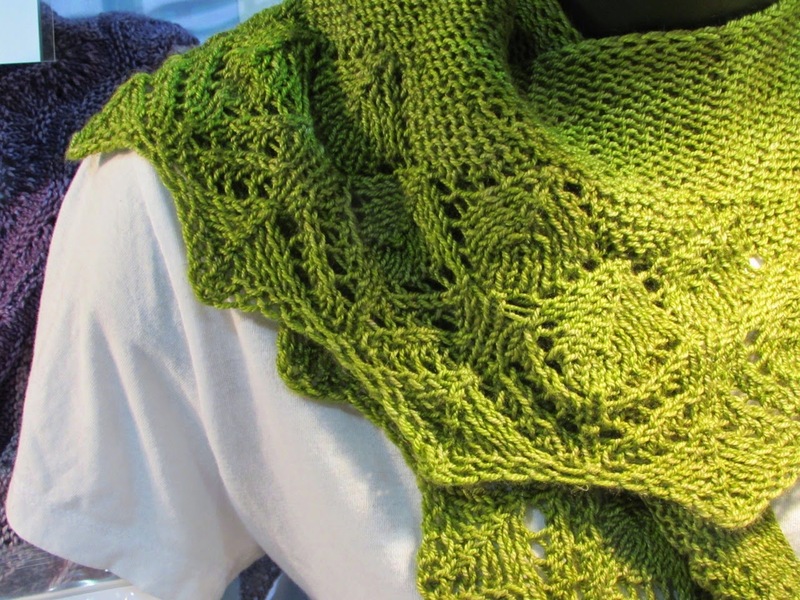 I've just opened sign-ups for another year of Yarn Knot. Four packages of yarn delivered right to your door over the course of a year. There's an element of surprise because you don't know what you're getting until the package arrives. That's the fun part for you. I get to experiment with different fiber blends that I don't normally offer. That's the fun part for me. All colorways are exclusive. I'm really looking forward to it. Knitting News. The cool, damp weather from Monday has lingered into today. In fact the temps today might be even lower than they were earlier in the week. All this means that I'm mighty tempted to haul out a couple of those freshly washed, just-packed-away woollens. I'm holding out . . . for the moment. Instead I'm turning my attention to sock production. Since I mentioned it in my last blog post, I now feel committed to Summer of Socks, Round 2. To get this train rolling, I started to think of new pattern and color options. Then I remembered my sock already under construction. This one needs just a few more rounds and then a toe. Yes, this is the first sock, but I rarely suffer from second sock syndrome. In fact for me the second one seems to knit up quicker than the first. This project is going to get me through this gray, wet day in May. 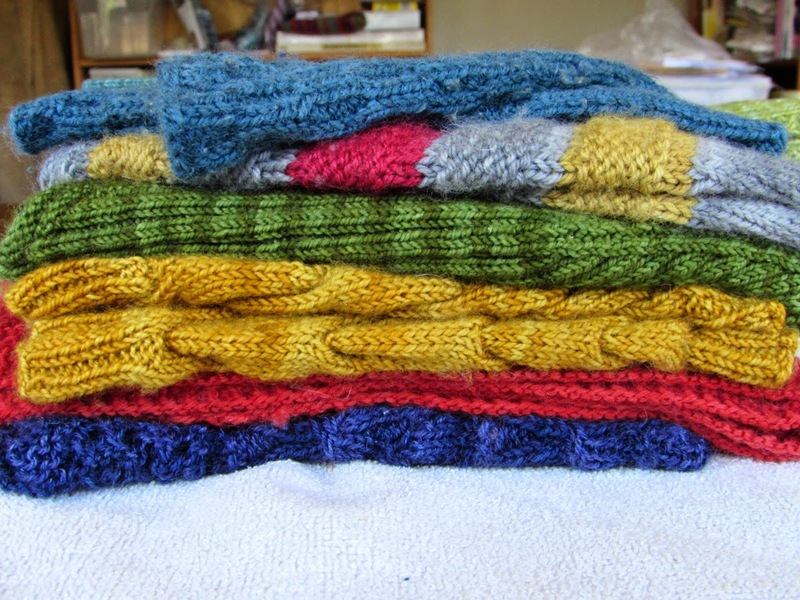 Since we're moving toward summer, I decided it was time for me to wash my handknits and pack them away. 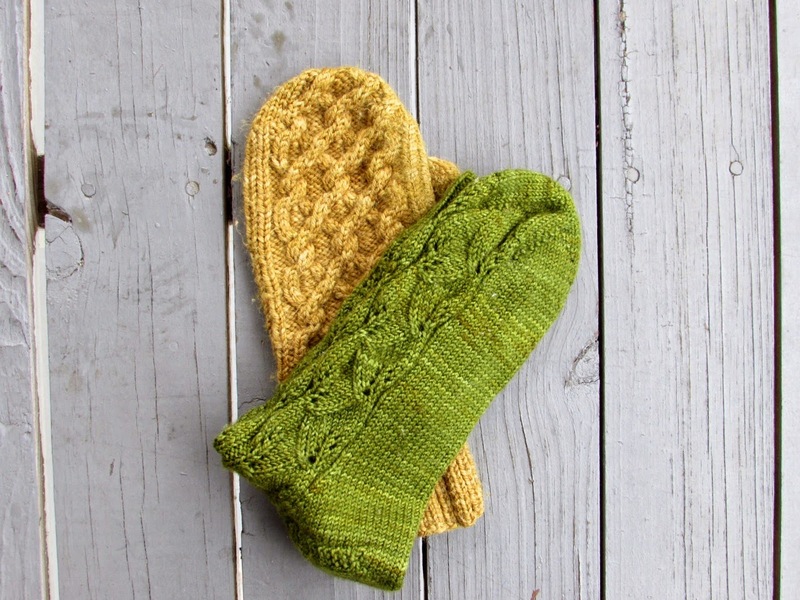 I hesitate to do this too early in the season since then I end up digging out a pair of fingerless mitts - maybe even a pair of socks or a hat - to fend off the chill. 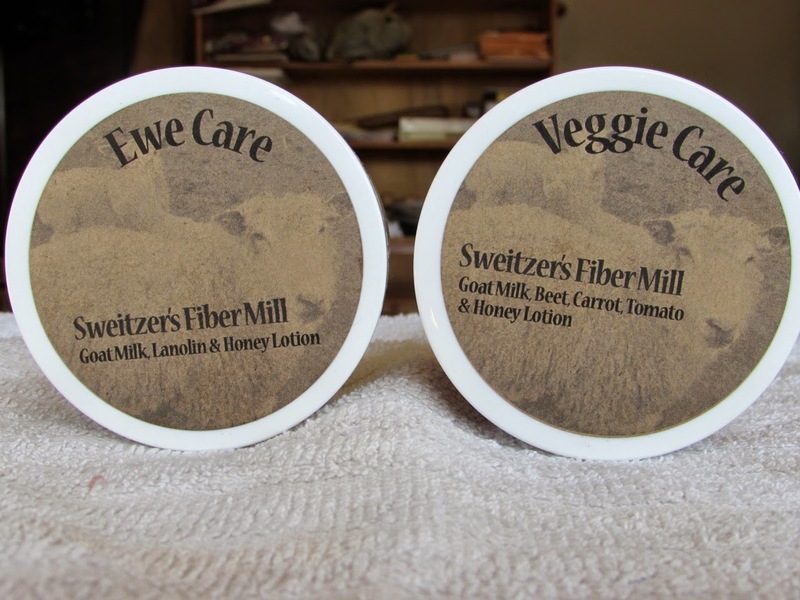 This weekend I reasoned with myself that the time had come for the big wool wash. It is, after all, the end of May. It should be safe to tuck things away for a few weeks. But as I sit here this morning in the cool damp, I'm wondering if I'm going to need some woolly warmth. I also use this washing ritual as an opportunity to assess my handknits. What do I have plenty of? What am I lacking? These aren't all my socks but most of them. Somehow I thought I had more - it seems like I'm always knitting socks. 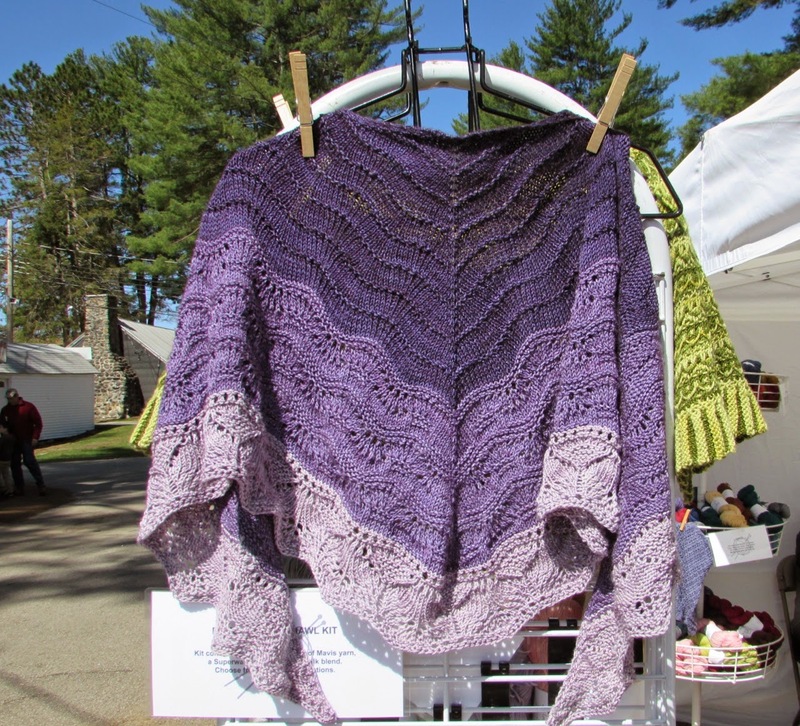 Then I remembered that a couple pairs that I knit this last year ended up as booth samples. I did find one pair that missed the bath, so there will be a repeat of this wool washing exercise. A couple pairs are showing wear, so it looks like I'm in for the Summer of Socks, Round 2. I also noted a lack of yellow, red and orange in my current collection. I'll have to remedy that. After everything was washed and accounted for, I was left with this. Somewhere I must have a matching pair. This has turned into a game of hide-and-go-seek between me and my handknits. I'm off to find the last of them. I have another day of washing ahead of me. It's a holiday weekend here in the States, and for many that means it's a long weekend. This weekend signals the start of summer, and it feels like many people around here have been in vacation mode since Wednesday. For me, the holiday means I'll try to squeeze in a little extra knitting time. 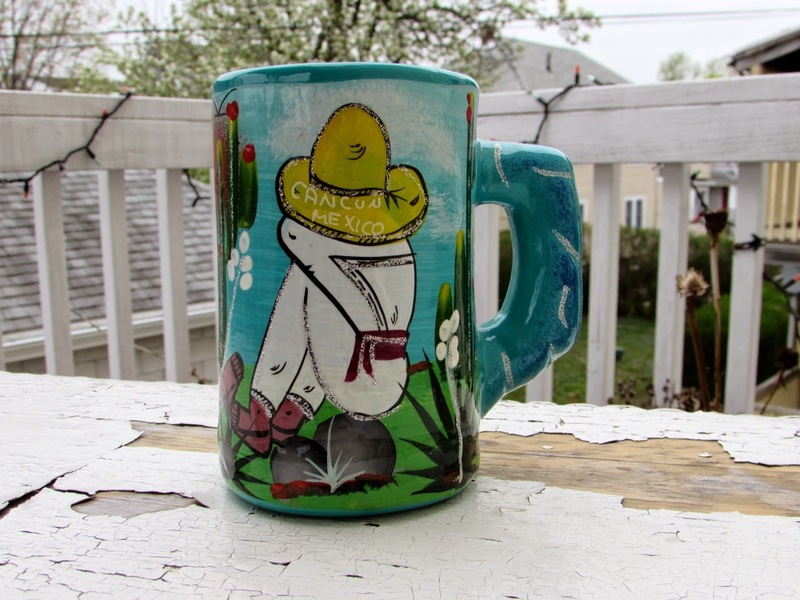 I'll even move it outside and knit on the porch if the weather cooperates. I lead a very simple life. To celebrate the holiday weekend and the end of May, I'm running the monthly giveaway. 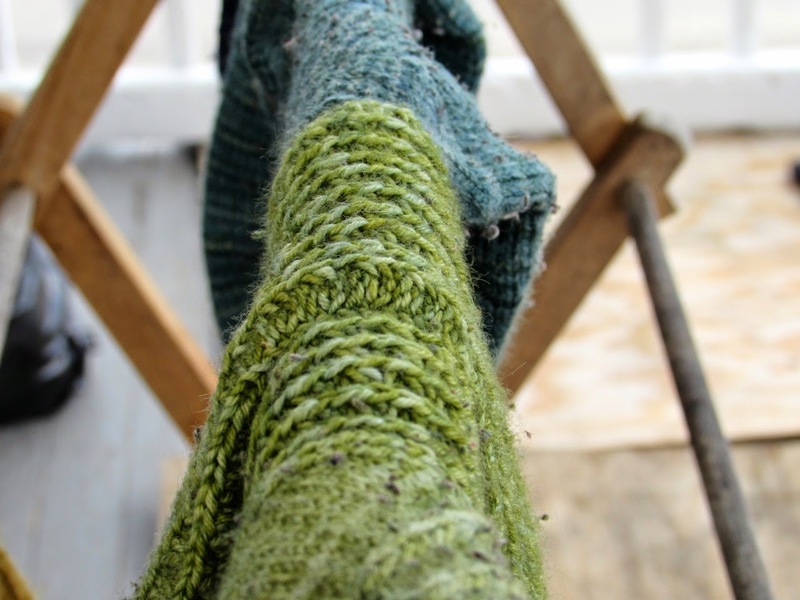 Simply leave a comment and let us know what you're working on this weekend - knitting or otherwise. 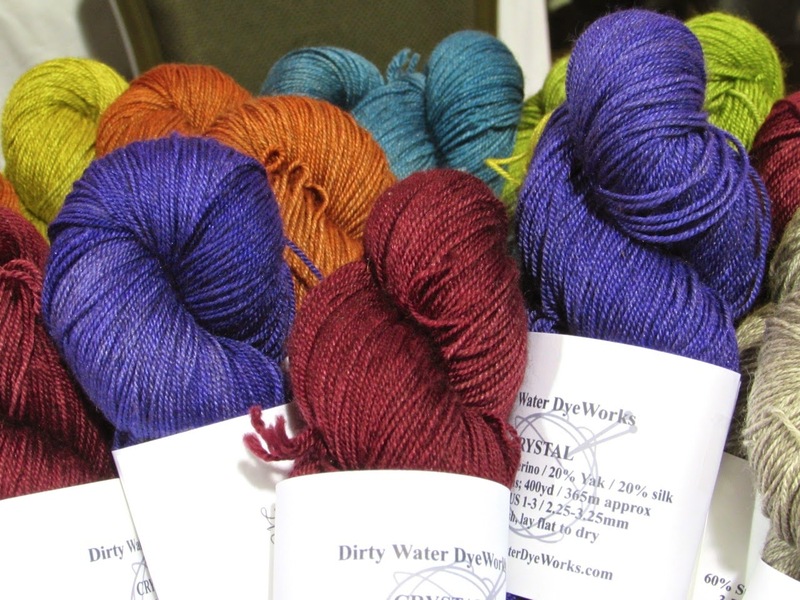 The winner, chosen at random, will receive a skein of yarn from Dirty Water DyeWorks - winner's choice. The contest closes on Saturday, May 31, 2014. Speaking of porches, I wish mine looked like this. All it needs is a couple Adirondack chairs. 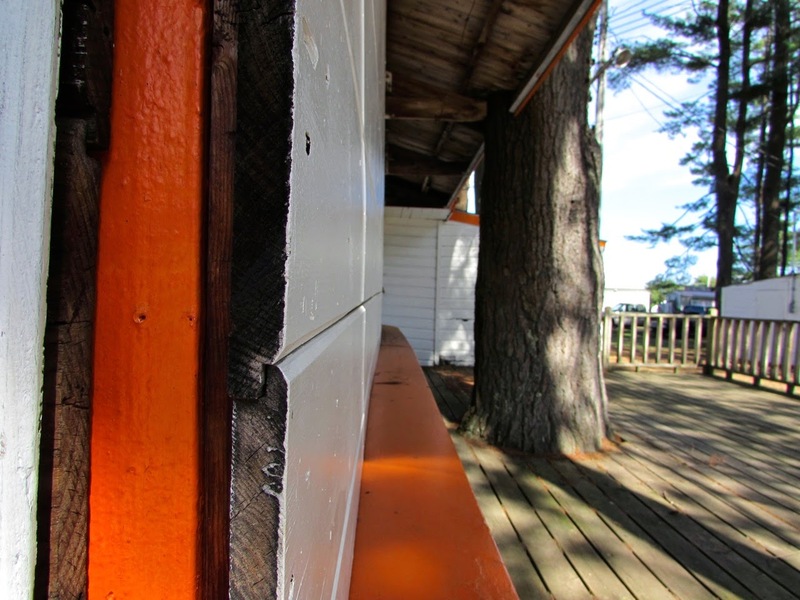 My color inspiration this week is all about wood. Different shapes, forms and colors. Was it the pattern? Or was it the yarn? I swing both ways on this, but I know some knitters who are on one side or the other. Either they won't buy yarn unless they have a specific pattern in mind, or they buy yarn with reckless abandon, with nary a thought for what it will become. Today I'm faced with the situation that the yarn came first. This combination crossed my path several months ago, but I shoved it aside. When these two landed together after a recent show, I decided it might be time to see what they will become. So today I'm off on a pattern search - a nice addition to my to-do list. Which comes first for you? 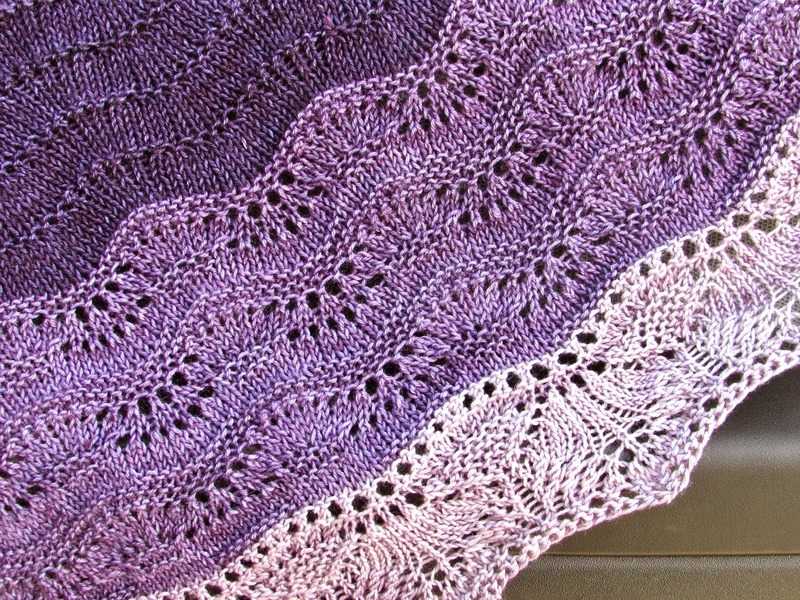 Is it the pattern or the yarn? 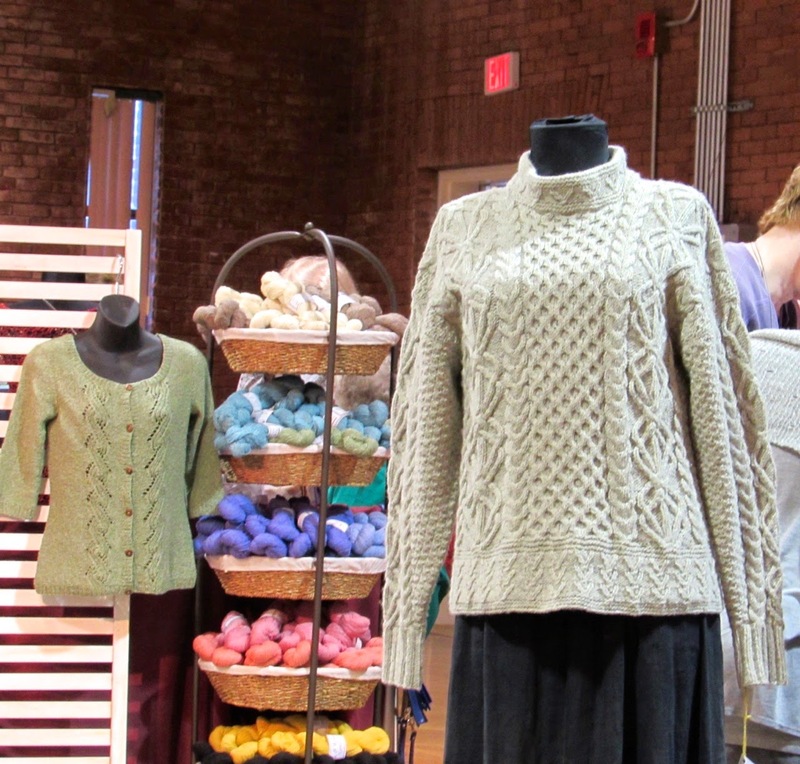 My 3-day gig at Knitting Lab was great fun. After four consecutive weekends on the road, I have a short break and time to catch my breath. A little extra sleep might come in handy too. 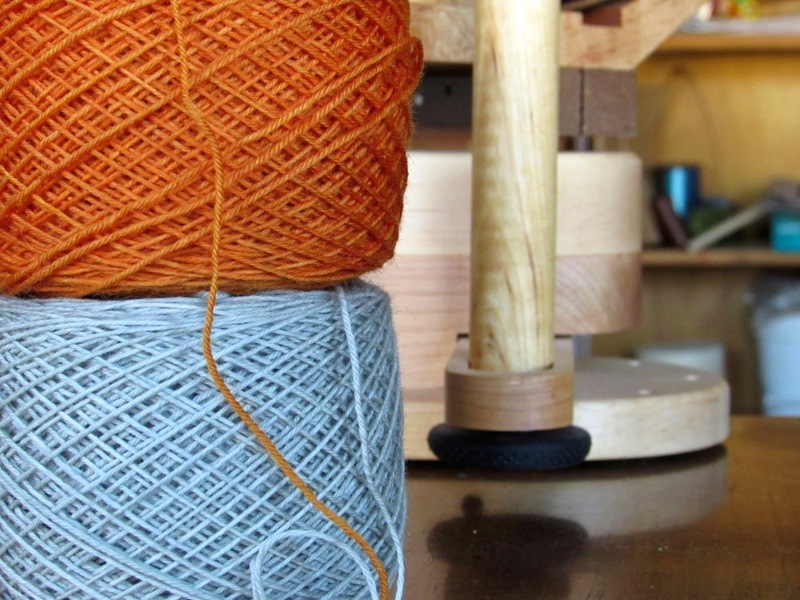 Knitting Lab draws people from all over the country, and it's a good opportunity to chat about new projects, fun colors and interesting techniques. 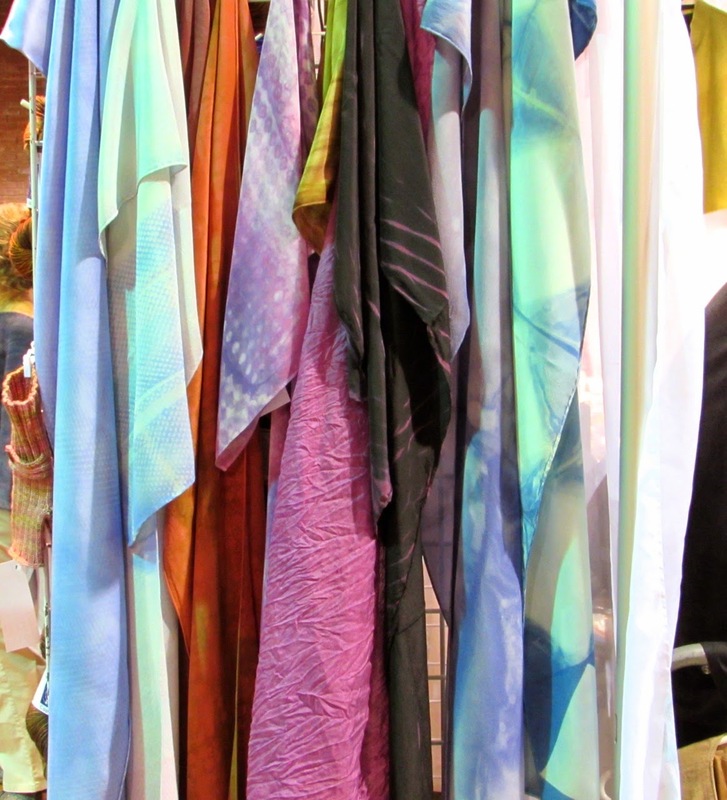 There was plenty to explore at the market, and I always manage to spot something new. This time around I actually bought a couple things. 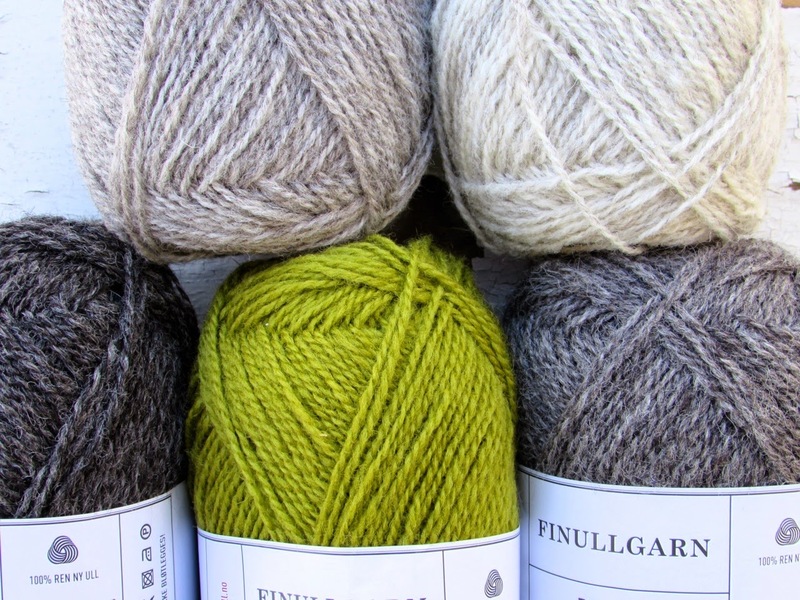 This selection of Norwegian wool is from Wall of Yarn (sorry, I can't find a link for them). Yes, they did have a wall filled with many colors of yarn. It was hard to pick and choose. I'm not sure what I'm going to make with these, but there are plenty of possibilities. Because I have a thing for gray and black . 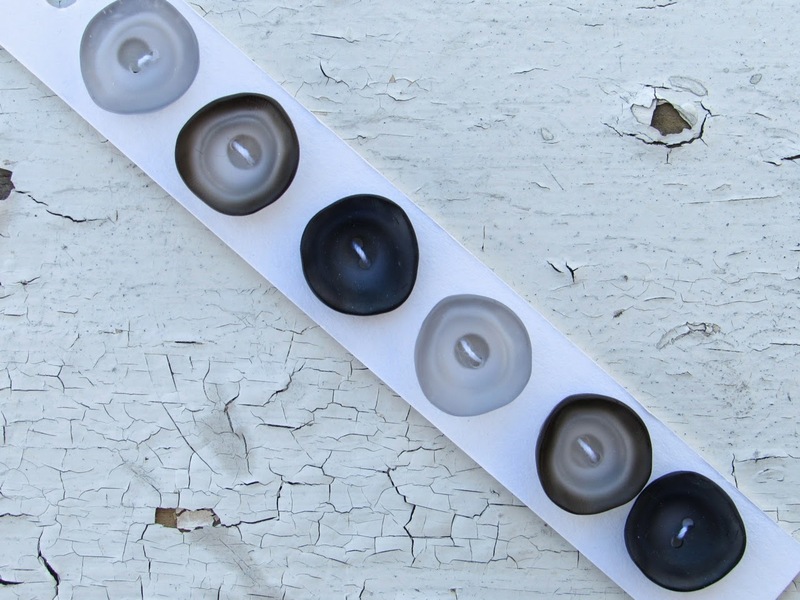 . .
More buttons for the collection. Somewhere in my stash I know I have yarn that will match. And since my hands always need a little extra help . . .
You can't go wrong with goat milk. Add some veggies? I'm all over it. Knitting Lab was inspiring in many ways. With that, I'm off to tackle a new week and new challenges. 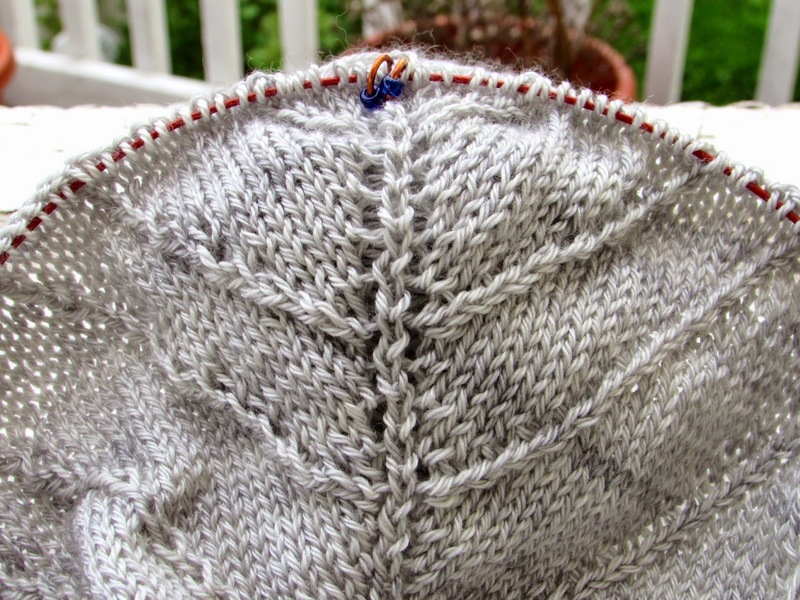 I'm in the midst of Knitting Lab, so this post will have to be short and sweet. Yesterday was the first day of the market. I didn't get to see much, but I have a sense that it's full of all kinds of wonderful. With any luck, I'll have a few pictures to share next week. For now I leave you with a glimpse of something new in my booth. 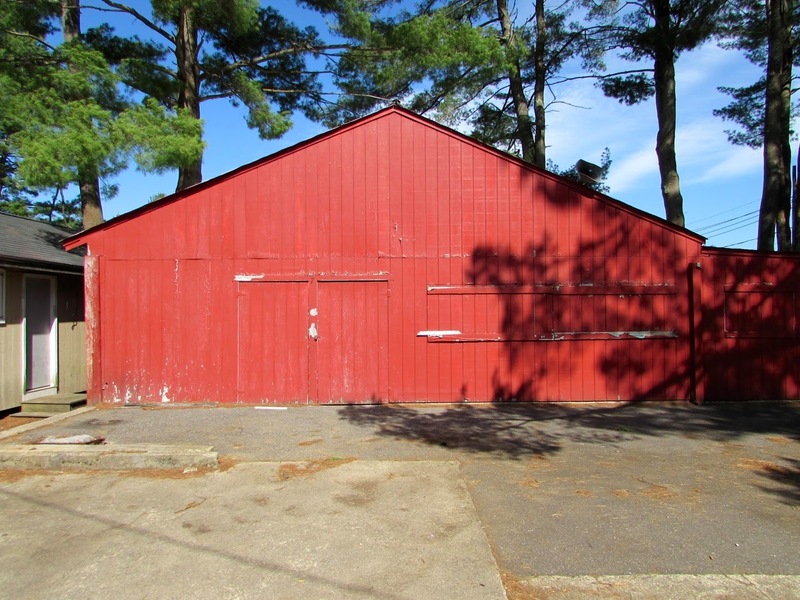 I found this week's color inspiration at the Deerfield Fairgrounds. 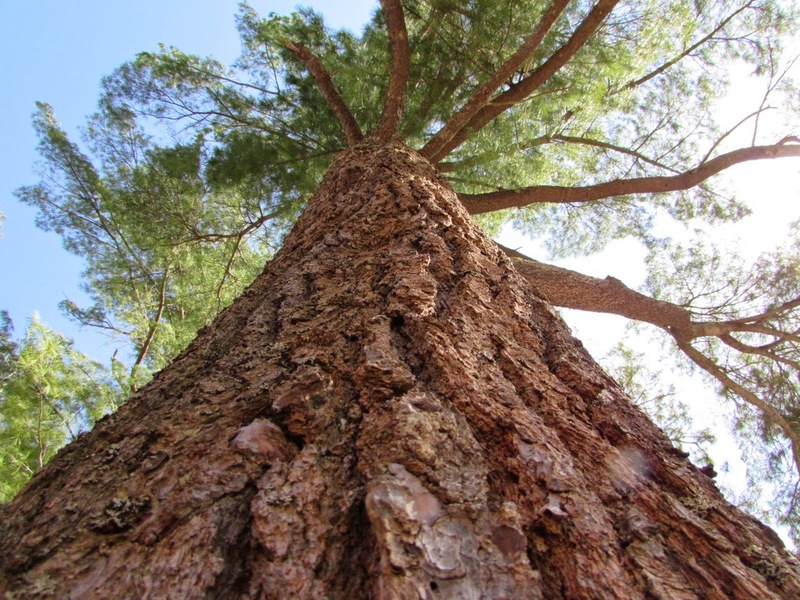 A lovely blue sky, wispy clouds and tall trees make it picture perfect. 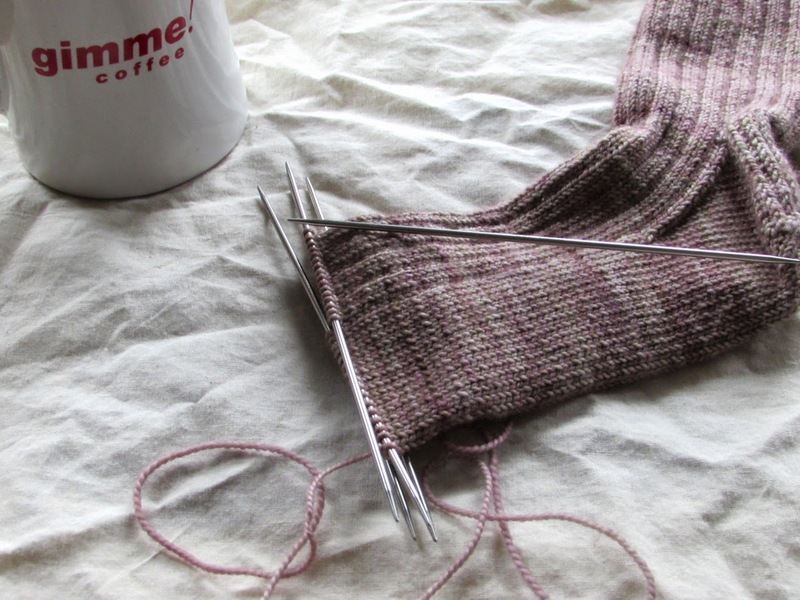 Does knitting ever creep into your dreams? I've been known to dream of knitting on occasion. In fact, just last night I had a knitting dream. 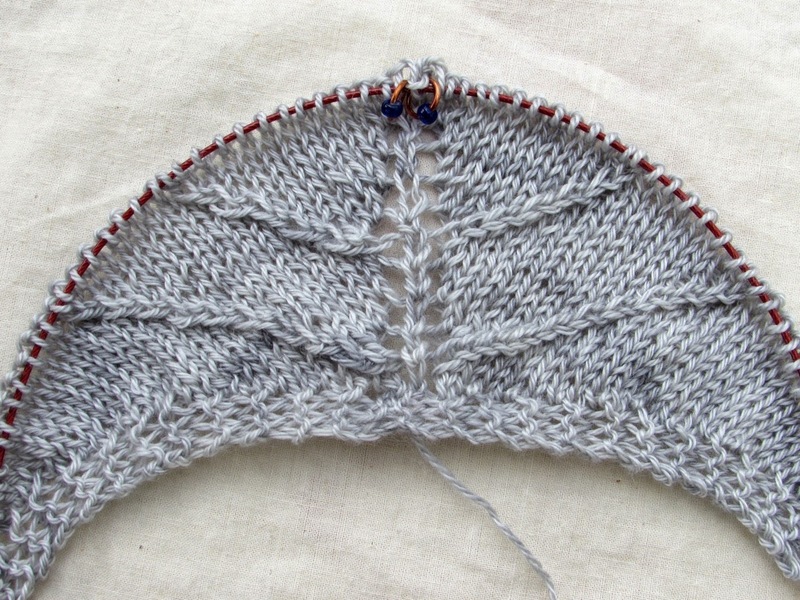 I was starting the border of my Cicada Shawl, and the project was coming along nicely. Right on schedule. Too bad it was only a dream. When I woke up, my Cicada still wasn't ready for the border. Originally my goal was to start the border a couple days ago. That goal seemed realistic when I made it, but then life intervened. I'm being flexible and have adjusted my goal. This project has had a couple issues along the way, but I'm not going to let that stop me. I'm determined to make it to the border and beyond. 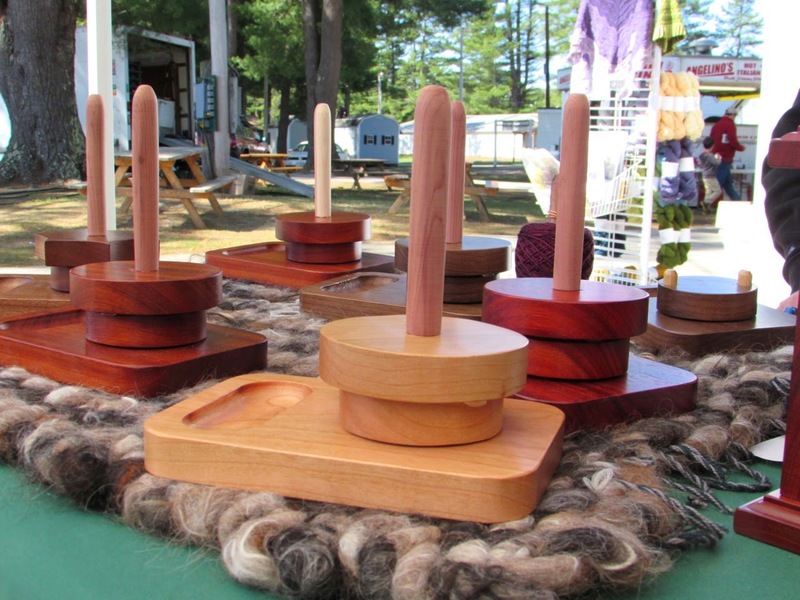 Schedule Update: Due to unexpected circumstances, this Saturday I won't have a booth at Rhode Island Wool and Fiber. I'm sorry to miss this event but look forward to being there again next year. 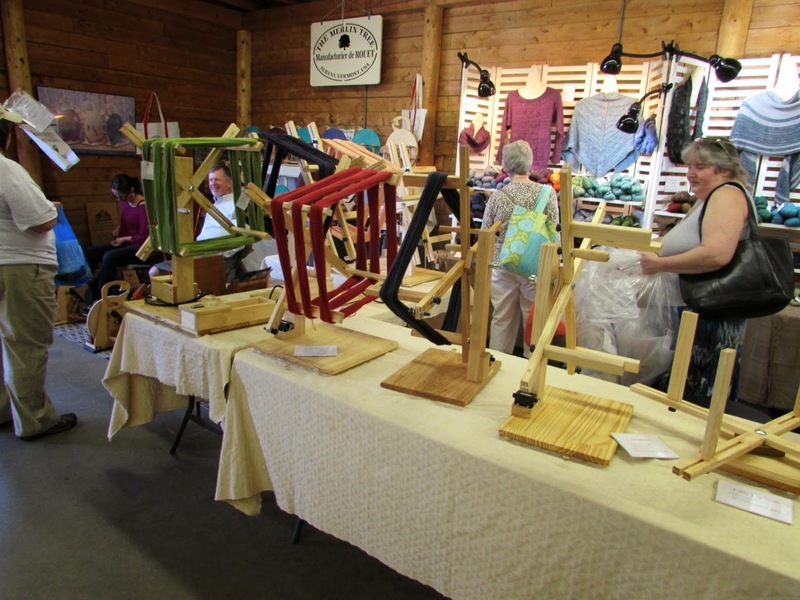 My Monday doesn't look very exciting after a fiber-filled weekend in New Hampshire. True to form we had a bit of weather excitement with rain and thunder on Saturday. But Sunday dawned bright and clear, and we quickly forgot about the damp and chill of the previous day. Follow along for a glimpse of the weekend festivities. I talked with so many people over the weekend. 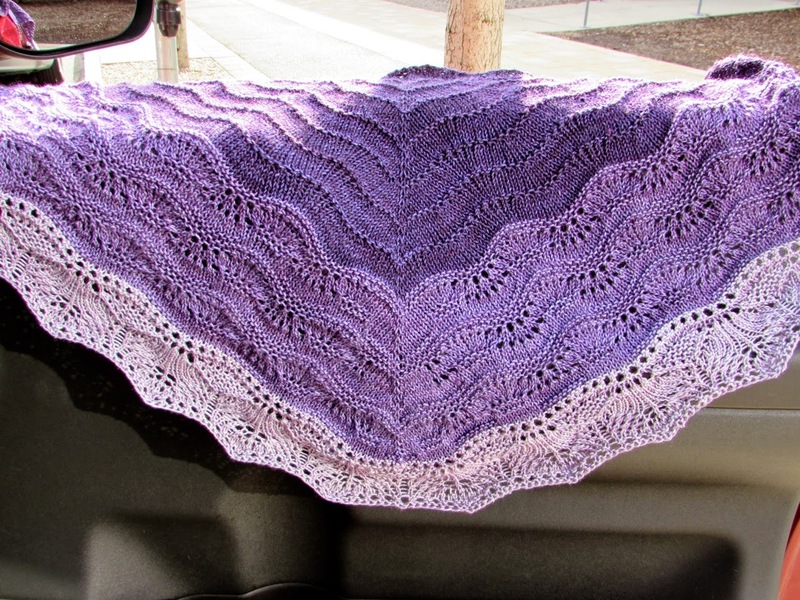 I always appreciate show and tell, and several people brought finished projects made with my yarn. It was fun to reconnect with people I see every year at this event. It was also a good opportunity to make new connections. Thanks to everyone who stopped by. I didn't knit one stitch over the weekend. Not one. Before I do anything else today - and believe me, the list is long - I'm going to spend a few minutes with my knitting and a cup of coffee. I'm on the road again later this week. It's time to recharge my battery. 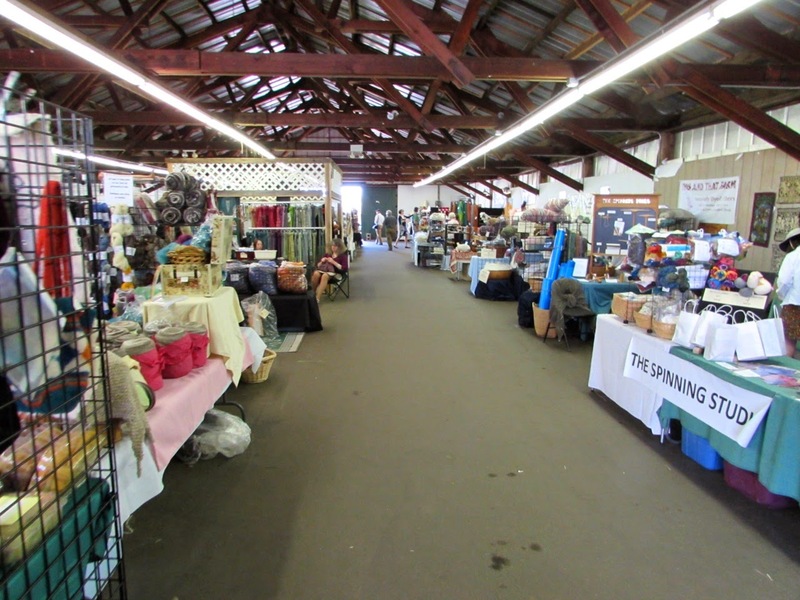 Today I'm making a quick trip to the Deerfield Fairgrounds to stake my claim for New Hampshire Sheep and Wool. I'm an outside vendor, and it's like being on a camping trip. Over the years I've seen everything from rain to sleet to snow at this event, so I have to be prepared for anything and everything. But before I head north, I have to stop at the hardware store, the Post Office, the gas station . . . the list goes on. I can never escape last-minute details. 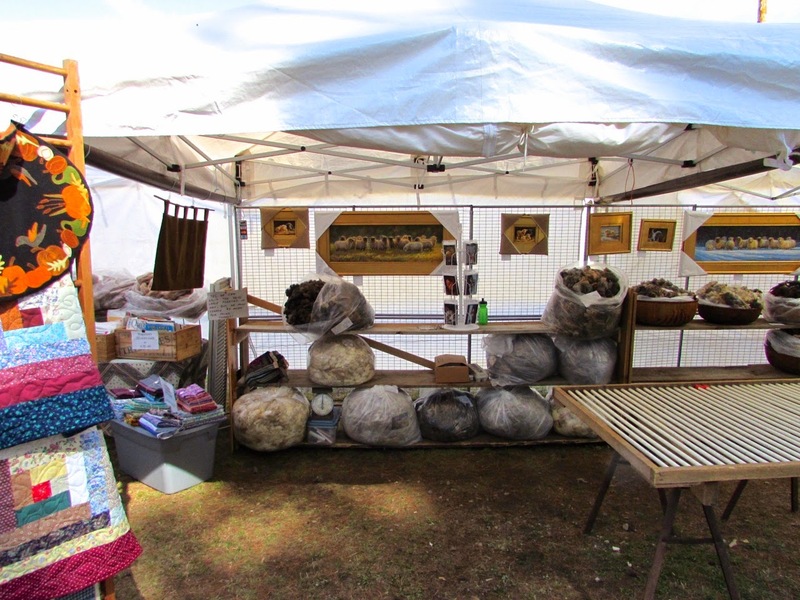 Since I won't know my exact booth location until later today, I'll be posting an update here, on Twitter and the Ravelry group. 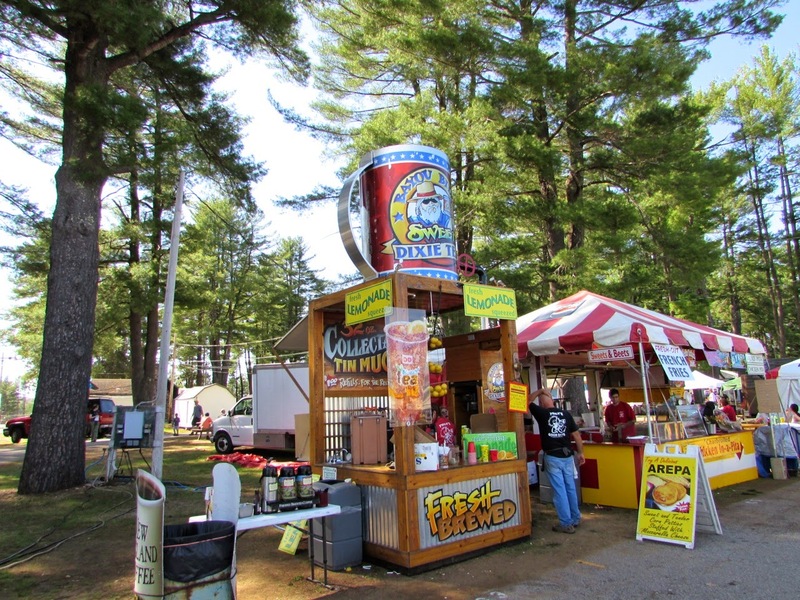 If you're headed to New Hampshire this weekend, stop by and say hi. Thanks to everyone who entered the giveaway here on the blog. I appreciate all the gardening mentions. And Denise, you're right to savor every moment with that new baby. The time goes by all too quickly, but I'm sure you've heard that already. The winner is Cate from Maine. Cate, I can't find contact information for you. Click on About Me on the right and follow the contact link. We'll work out the details. Cleaning out cupboards can often lead to surprises. There's a bit of that going on in my house these days. It's fun to find a long-lost item, and it feels good to get rid of clutter that's taking up space. 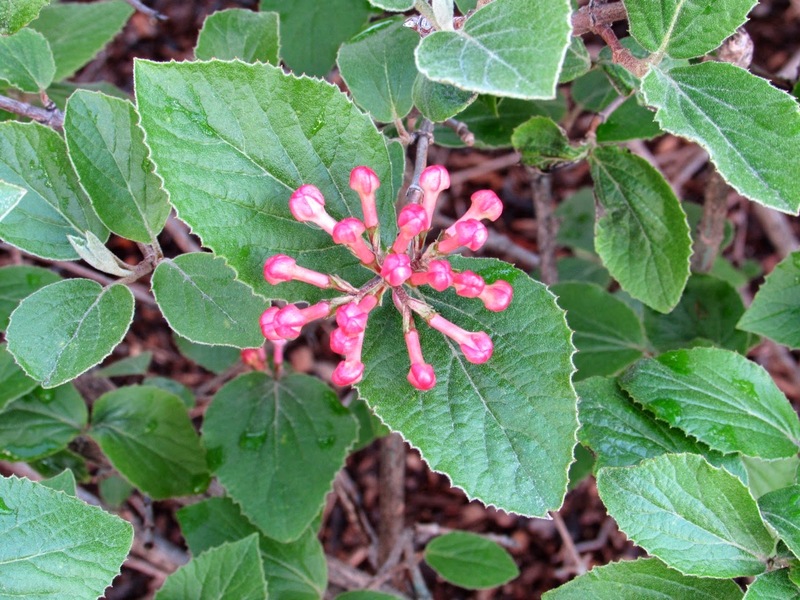 One pleasant surprise is my color inspiration for the week. Update: My booth is right around the corner from Angelino's Sausage. Follow your nose . . . 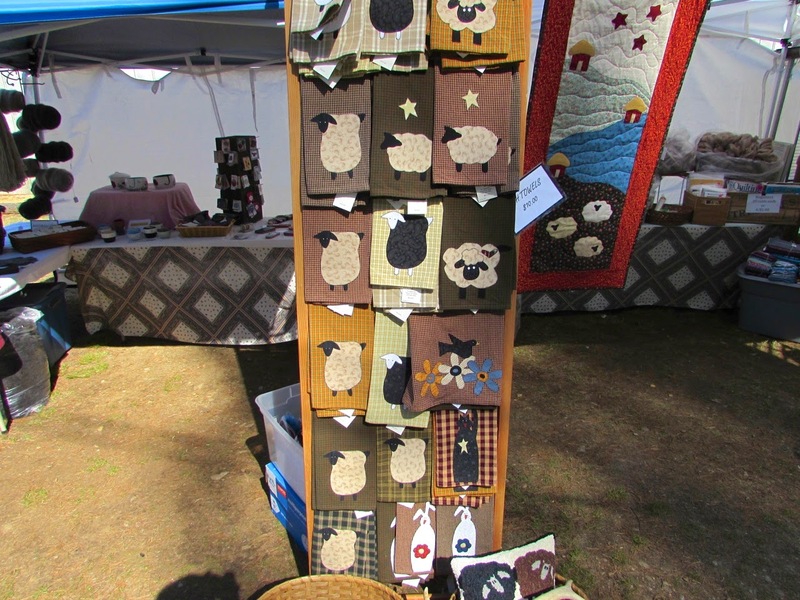 I'm pulling together the last bits and pieces for this weekend and New Hampshire Sheep and Wool. I seem to be ahead of schedule - something that doesn't happen very often. Either I've forgotten something important, or I've become more efficient. Since I prefer to put a positive spin on things, I'm going with the latter. My recent dye runs have focused on kits, and, for once, Mother Nature has been on my side. 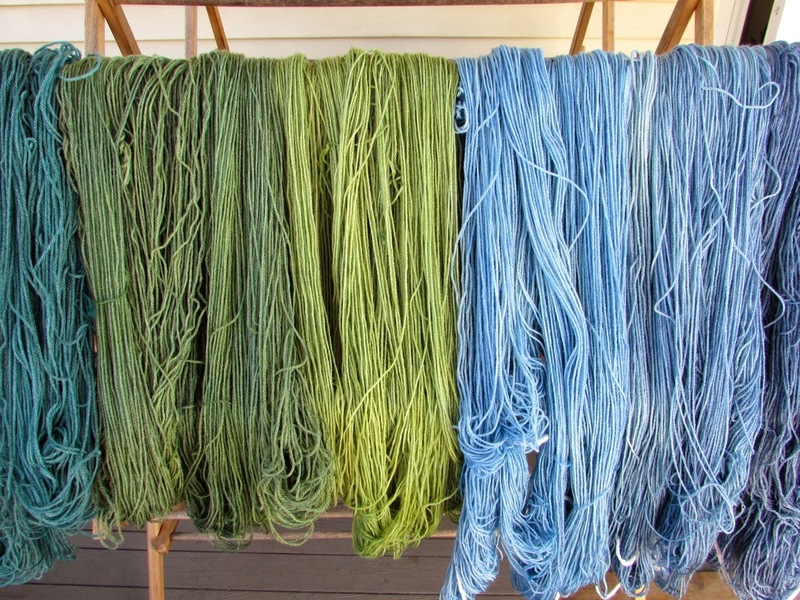 The air has been dry - perfect for drying yarn. In keeping with that positive attitude, I'm optimistic that this weather pattern will hold through the weekend. 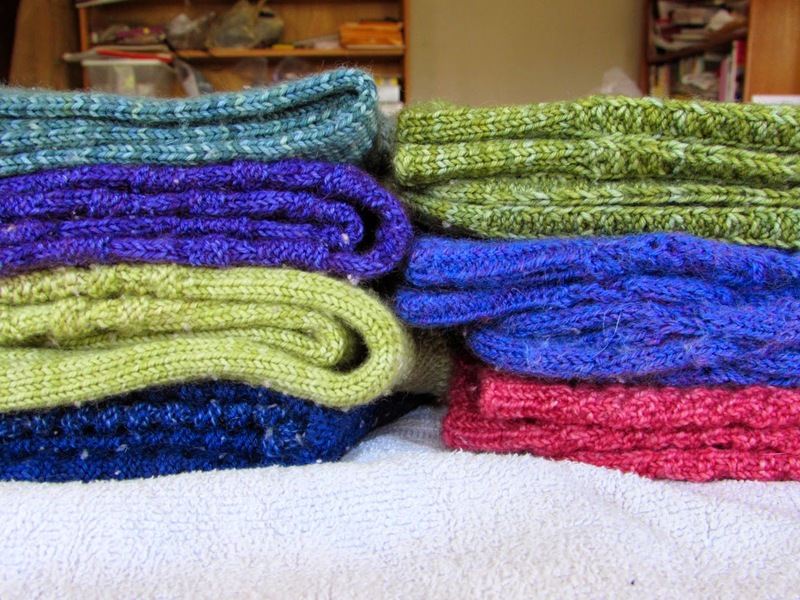 Today is the final production phase for these skeins and many more. I'm going to pour myself a big cup of coffee and settle in. It's time to assemble kits. When my Monday starts like this, I know it can only get better. This morning my son had an appointment to have his wisdom teeth removed. 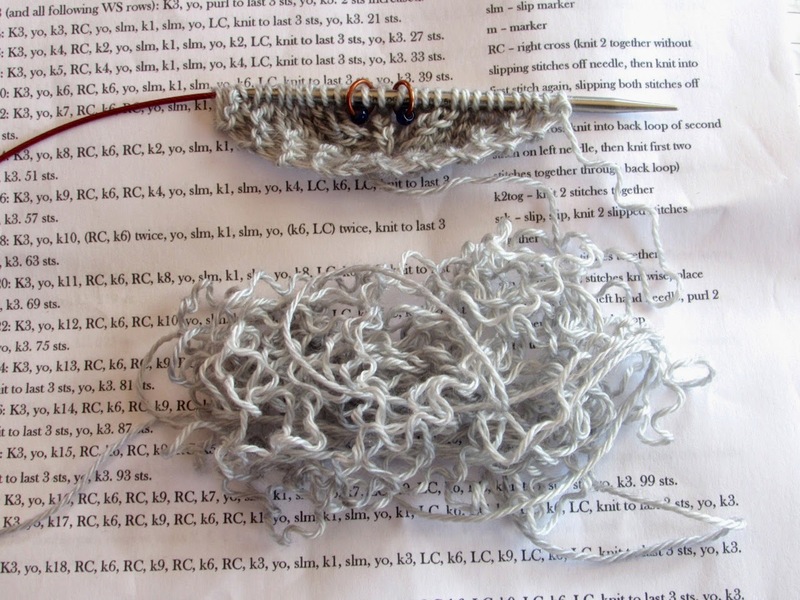 I was looking forward to some quiet knitting time, but first I had to sort out a minor mishap. I had one wonky stitch and had to perform a quick bit of knitting surgery before we headed out. By the time I had dealt with Monday morning traffic madness, a little downtime in the waiting room was just what I needed. As luck would have it, my son had only 3 wisdom teeth. I'm not sure how much more knitting time a fourth tooth have would have given me, but I'm convinced that some days I would pay for more waiting time. All too quickly we were out the door and on our way. At least I had enough time to knit up what I had ripped out and then some. Forward progress on a Monday . . . I'll take it. For today, a parade of purple. With all the travel this time of year, I feel like I'm living in my truck. This photo shoot comes to you courtesy of the wool wagon. 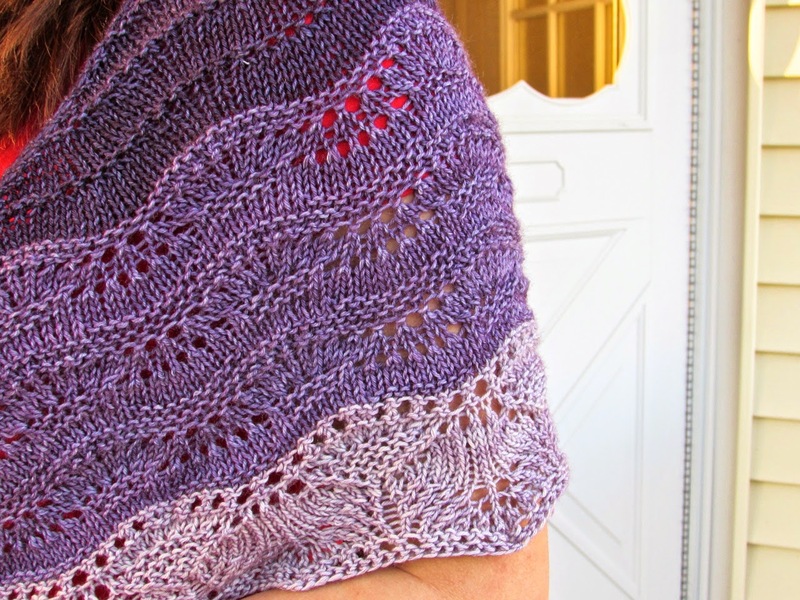 Brush Creek is a top down shawl with lace panels that move from simple to more intricate. Shifting gears from one section to the next keeps the pace moving. There's no time to be bored. The yarn is Mavis, a Superwash Merino / Silk blend. Softness, drape, subtle sparkle . . . this yarn has it all. Since this design uses odd amounts of each color, I've created kits with different color combinations. They're ready now and will be on the road with me at events. I'll post them to the website as soon as there's a bit of wiggle room in my schedule. This week's color inspiration holds so much potential.